O was one of the more slender humans Mhumhi had ever seen, which as odd, because she also looked considerably more well-fed than the city hulkers. She was all long limbs and languid motions, her fingers close together as her thin palms perpetually turned outwards. Her hair was black, cropped close to her skull, and her skin was nearly the same shade. She was moving to the stairs now, walking slowly, her eyes hazy. Mhumhi walked beside her, staring up at her, so that he was almost stumbling over his own feet. There was something eerie about her still, but also something fascinating, a sort of sleepy dignity. It was hard to explain. Kutta stood by the door to the stairs, still looking uneasy, and O stopped her slow tread and looked at her. This seemed to surprise O, and she thought for a moment, drawing her hand close to her face again, still without touching it. “The- Don’t call them dogs,” said Kutta. “Don’t be stupid,” said Kutta. He cast a look through the little window in the door at the dark-eyed screamers. They were still hanging back in a huddle in the stairwell. He could see the top of Tareq’s head over the shoulder of the one still holding him. O walked forward again and pushed open the door, her thin fingers splaying. The screamers seemed to cringe. “Hold it, please,” said O. Much to Mhumhi’s surprise, two or three of them shuffled forward to grab at the edge of the door, their heads down. O reached forward and stroked the hair of the nearest one. The voice was Mini’s. The screamers parted way, exposing the one holding her, a frightened-looking male. Mini gazed at her, her pop-eyes half lidded, and her tongue sticking sideways out of her mouth. “You should take me,” she said. Mhumhi felt there was an odd kind of finality to her tone. He wondered that she did not sound happier. This was, after all, what she had been hoping to see- a friendly, intelligent human. O reached out and extracted Mini from the screamer, which gave a whining sound of protest as the little dog was pulled away. She hugged her to her chest. There was a bit of commotion amongst the screamers then, a bit of whining and shifting. The one holding Tareq stepped forward. The little boy was rubbing his eyes with one hand, keeping hold of his screamer’s shoulder with the other. He looked at O and suddenly pushed himself closer to its chest, putting both arms around the neck. “Is it?” O tilted her head slightly to the side. Tareq turned his head and pushed his face into the screamer’s chest, seeming uncharacteristically shy. Mhumhi thought that even he was affected by the odd aura around O.
O looked down at her, perhaps surprised to hear such an accusation from the little thing she was cuddling. Mini gave a wheeze. Mhumhi realized it had been attempt at a snort. For a moment O said nothing, but her body gave a little tremor. “To know what?” Mini swallowed with a clicking sound, and turned her head to look back over at the cringing screamers. Mhumhi felt his heart beating slowly in his chest. He could still see mild confusion in Kutta’s eyes… but he thought he understood what O meant. To know, yes. He looked at the screamers, clustering together, some of them patting at Tareq. Mini gave a little growl, and O froze. “Records?” O was looking down at her in a way that implied she wasn’t sure if she wanted to keep holding her. “I don’t understand,” said O. “No, you don’t, do you,” said Mini. She gave a rasp of a laugh. “Of course! What did I expect- ah, I don’t know. Something fierce. Something powerful. A kind of- a stupid-” She lapsed into silence. O gave her head a tentative stroke. “You’re so sad,” she said. She was struggling in O’s arms, whining, growling. She snarled, and O gave a little cry and dropped her. She landed heavily on the carpet, crumpling. Kutta whimpered and ran to her. “You bit me,” said O, staring at her arm. There was a single spot of dark blood welling up on her skin. “You’re supposed to be better than this,” moaned Mini. Kutta was licking at her frantically, and Mhumhi tucked his tail and ran up too. The foul smell was getting stronger from her belly. “Ugh,” said Mini. There was blood on the carpet underneath her midsection. 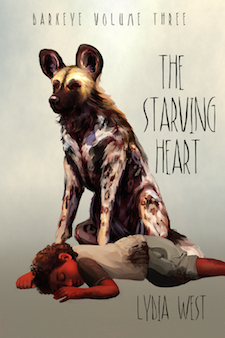 Mhumhi pushed his nose into her fur and found it hot and damp, her skin shivering. O looked up at him. “Mini,” whimpered Kutta, licking her forehead in swift strokes. “Hurry up!” Mhumhi snarled, making O flinch. He stopped, looked back at Kutta. Her yellow eyes were wide. Mini was a little black heap on the carpet. Mhumhi’s chest was heaving as he stared at her. He sat down on his haunches, closed his mouth. Tareq, forgotten in the screamer’s arms, whined. It was a doglike sound. “I don’t want it,” he whined. “I don’ want this.” Fluid was streaming from his nose. “That’s my dog.” He burrowed his head deeper into his screamer’s bare chest. Kutta sat with her forelegs splayed apart, her head low. One of the screamers had been stepping forward, arm stretched towards Mini, but at her growl it cringed back. Mhumhi raised his head and stared at its face. He saw the fear Kutta had incited, and some curiosity- it was looking at Mini’s body again. It was the same curiosity they had shown towards the dead cow. Kutta showed her her fangs, but seemed not to have the energy to do anything else. “It’s not your fault,” said Mhumhi, in a stiff way. Kutta and Mhumhi both looked over at her, for once not having to crane their necks, for she was crouching on their level. She was still stroking Mini’s side. Suddenly her eyelids fluttered and she swayed. “That’s my dog,” said Tareq, his voice muffled in the screamer’s skin. “Yes…” O shivered. “She’s not my dog… I- I feel so bad, though.” In a swift motion she raised her hand and wiped her eyes. She swayed dangerously again, her fingers curling into Mini’s fur. “That’s my dog,” Tareq said again. O slowly removed her hand from Mini’s side. “I’m really sorry,” she said. “We should take Tareq out of here,” said Kutta, addressing Mhumhi. Kutta put her ears back and looked at Mhumhi. In answer O extended a hand, and a screamer shuffled forward. The fur on Mhumhi’s back rose. Mhumhi hesitated, relief filling him, and looked at Mini again. It did not really matter… there was nothing left in her that cared… but somehow, it was better. The screamer knelt and started to pick Mini up, and Kutta let loose a little growl. When Mhumhi looked at her, she lowered her head and tail. “It isn’t right,” she said, low. Mhumhi sensed she wasn’t talking about the burial. Mhumhi couldn’t help but keep watching as the screamer tucked Mini in its arms. Her front was now as limp and boneless as her back half had been. Her head wobbled as it stroked it. Another screamer came close and pulled on one of her paws. The screamers cowered their way back to the door. Mhumhi watched that dangling paw around the screamer’s back. Perhaps it felt like a lifelike movement to him. Perhaps he was waiting for Mini to prove that she had merely been pretending again. Perhaps she had learned to quiet even her heartbeat this time. This feeling was familiar, and detestable. He looked again at the screamers’ blank eyes, and felt something like envy. “What is?” asked Kutta. She had stepped closer to Mhumhi, and now he felt the brush of her warmth against his side. “Everything a dog could want,” said Mhumhi, tone bone-dry. O didn’t seem to pick up on the sarcasm. Mhumhi opened his mouth and closed it, a bit stunned. He had not really noticed it- but Kutta was absolutely right, O had been speaking Dog to them the whole time, with barely an accent. “Dog?” O tilted her head a little. O gave him her small smile, though it quivered this time. She rose to her feet in a fluid motion, one hand against the wall for balance. Again she paused, swaying, even with her support against the wall. O nodded, and then collapsed on the floor. “Oh!” cried Kutta, and Mhumhi wasn’t sure if it was the name or the exclamation. He himself rushed forward, sniffing her thin hair. There was still a pulse beating in her scalp. Kutta prowled around her other side. Mhumhi could not say. O’s eyes had closed, and her ribcage was moving slowly. He nosed her arm, where Mini’s bite wound had already begun to scab over. “Fell asleep?” repeated Kutta, with a kind of mild outrage. She took O’s elbow in her mouth and shook it a little. Mhumhi licked her head, tasting her coarse hair. O did not wake up. “She said something about this happening-” Mhumhi was starting to say, and then they both froze. Another hulker had emerged from a door at the far end of the hall and stopped short. Mhumhi felt her eyes like a brand- and here were he and Kutta, with their bloodstained faces, over O’s fallen form. Kutta still had O’s arm in her mouth. The other hulker’s eyes were very wide, and she made a choking sound. Kutta quickly dropped O’s arm. “Dogs,” moaned the other hulker, and then she grabbed at something at her waist, something small and metal. There was an aggressive fear to the motion, and Mhumhi felt himself tense. “We’re not here to harm you,” said Kutta, waving her tail a little, though it was still stiff- the panicked look on the other hulker’s face did not bode well. She was pointing the metal thing at them. It looked vaguely familiar to Mhumhi- the bouda might have had some of the same thing. The hulker pulled back on a top piece that made a clicking noise, and Mhumhi eyed the round hole in the front. They all jumped, and the metal thing made an extremely loud noise. A bit of plaster fell down on Mhumhi’s head, and he shook it off with a twist of alarm. A cracked hole had suddenly opened up in the ceiling above him. He burst into noisy tears. The screamer put him down somewhat delicately. “Your dogs?” said the hulker, in a tremulous way. Tareq was in no fit state to respond, clearly, so Mhumhi spoke up. Mhumhi and Kutta exchanged a look. “She’s a heavy sleeper,” Mhumhi pointed out. His ears were still smarting. “Sleeping?” the hulker repeated. Slowly she put her arm down. “She was awake a moment ago,” said Mhumhi. He was feeling a brush of anxiety in spite of himself. What if she wouldn’t wake up? There was relief in her tone. Mhumhi noted that she showed little of the drowsy-dizziness that O had shown. She also seemed rather older, closer to what Lamya had looked like. “Are you one of the ones that was sleeping?” he asked. Tareq gave a loud sniffle. Several of the screamers had gone to cluster around him, all of them trying to encircle him in their arms, making whining noises. “That’s a child,” said the hulker. “A puppy,” Kutta corrected, with some weariness. The hulker glanced at her. Poor Mini. So close, and still no good for her. And even closer than she thought when she gave up.